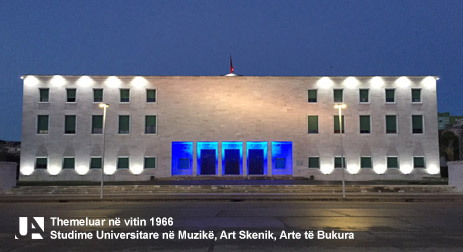 The University of Arts, (UART), is a public institution of higher education with artistic character in Albania, which offers Bachelor Degree for the first cycle of studies, “Master of Science”/ “Master of Art”, “Professional Master Degree”, “Integrated Master Degree”, in Music, Fine Arts, and Scenic Art. Established in 1966, the Higher Institute of Arts put together three artistic institutions: the State Conservatory of Tirana, School of Fine Arts, and High School of Actors "Alexander Moses". In 1990, according to the changes in the education system, the Higher Institute of Arts was established at a University level and was named “Academy of Arts". According to the DCM nr. 234, dated 23.03.2011, University of Arts was established on the foundations of the Academy of Arts, maintaining unchanged the structure of its Faculties. Its main purpose is to offer higher professional education and creative activities in the field of art and culture, to deepen the professional qualification of scientific specialist in the field of art and culture, as well as contribute to improving democracy and civilization standards. The entire path for over 40 years of the University of Arts has been a systematic growth path for the specialties, also the implementation of the Bologna Card in the recent year had it’s own importance. Admissions at the University of Arts are realised only by means of competition, the criteria of which have their specifics about the required specialty. 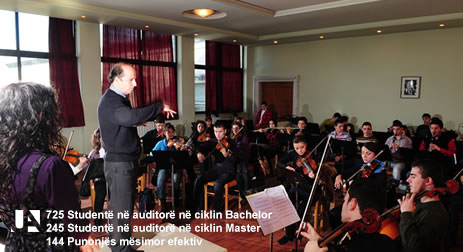 Currently in its auditoriums study 947 students, who are led by a teaching staff of 386 assistants, pedagogues, associate professors and professors, of which 119 are part of the internal academic staff of UART. Teaching Troops and collaborators of the Faculties are well-known names in the areas where they operate - musicians, painters, sculptors, movie and theater or television filmmakers, actors, set designers and choreographers - with deep and extensive knowledge in theory and in practice. Most of them have received art awards for special contributions and creative works. 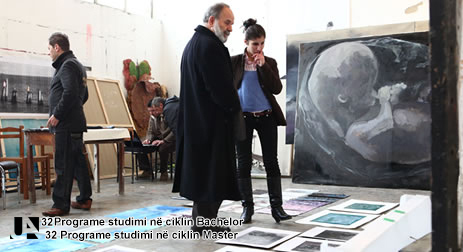 The internal environments of the University of Arts as studios, Atelier, auditoriums, Great Hall of Concerts, "Çesk Zadeja" Hall, Experimental Theatre "Black Box", Gallery of the Faculty of Fine Arts and the Library, create an interactive relationship, where students have the opportunity to study in a specialized environment and get engaged in creative works too. 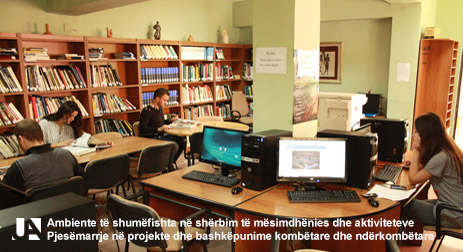 The Artists educated in this institution constitute a generation force in the Albanian cultural life. The Collaboration and the ongoing contacts with Schools and Academies of Art in Europe and beyond, being a membership of the International Organisation of Art Institutions and the active participation in activities of international workshops have contributed to the introduction and use of new teaching methods. Strengthening institutional links with the European Academy of Art and universities is a priority of the current stage of the University of Arts. Boulevard " Dëshmoret e Kombit ", Square " Nënë Tereza "